GENERIKA closed out the elimination round with their sixth straight win, edging top-seeded Petron 18-25, 25-12, 25-20, 18-25, 15-11 on Wednesday in the Philippine Super Liga Grand Prix at the Alonte Sports Arena, Binan, Laguna. Aby Marano took charge for the Life Savers with 20 points from 14 spikes, two blocks and four service aces, while Paneng Mercado had 12 points and skipper Cha Cruz added 11. Russian import Natalia Korobkova, who played only in the first two sets, had nine points as the Life Savers scored their seventh win in 10 matches. 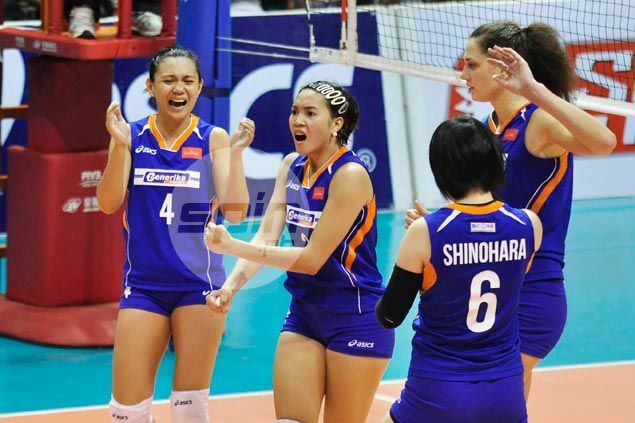 Michele Gumabao had seven points, Divine Eguia made five and Jeushl Tiu chipped in four for Generika. The Life Savers and Petron have already secured their respective spots in the semifinals and will face RC Cola Air Force and Cignal, respectively, on Friday. "Ang habol namin mapataas ang kumpyansa ng players," said Generika assistant coach Benson Bocboc, who called the shots as head coach Ramil de Jesus handled La Salle in the UAAP. "Going into the game goal namin magamit lahat lalo na ang second stringers." "Kasi in the previous matches medyo off (ang second stringers) kaya ngayon binigyan sila ng kumpyansa. Sa laro kanina nakita naman namin ang adjustments na gagawin namin for RC Cola Air Force," added Bocboc. Dindin Santiago scored 16 points for Petron, while Frances Molina added 12 and Mina Aganon contributed 10. American import Alaina Bergsma, who was used only in the first set, had five points as the Blaze Spikers finished the elimination round with an 8-2 record.